Commander Charles Samson, center with pointed beard, played a major role in the development of naval air power in the early 1900s. As an officer of the Royal Naval Air Service he made several experiments flights, for example taking off from an anchored ship and a ship underway, an attempted take off from a towed barge and night bombing. Behind Samson and with the monocle is his brother Felix, a Royal Navy Volunteer Reserve Lieutenant, who developed armoured cars and lorries for the Royal Navy fighting in France. 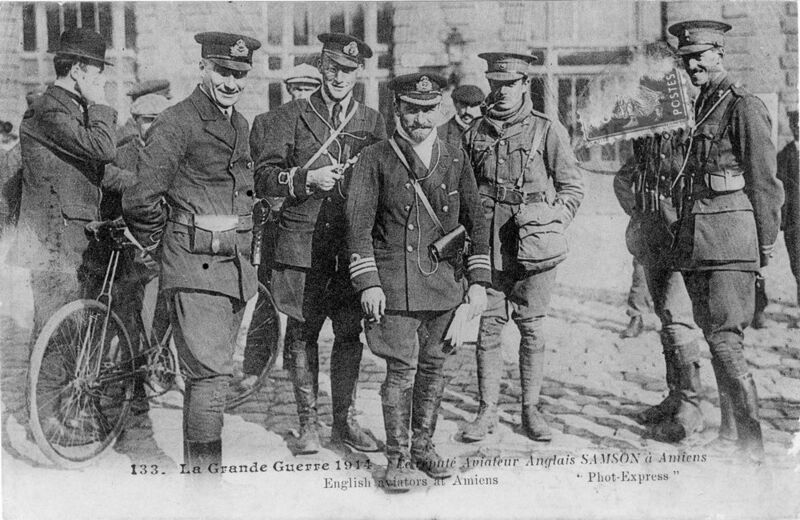 This photograph appears to be of an early Franco-British Aviation Company (F.B.A.) seaplane although we cannot be sure. The radiator has the characteristic shape of F.B.S. aircraft as is the arrangement of a cockpit with a small windscreen and forward gunner/observer's station. The photograph shows remarkable details of an early seaplane - riveted metal fuselage, wires and control cables running off from the cockpit, wooden spars and fabric-covered wings. The observer is cranking up the engine and we can see four sparkplugs to the left so it is a v-8 engine with direct exhausts, three of which are in the photograph. Is it the petrol tank just behind the pilot with a brass tap to cut off the supply? The lower wing roots are fixed to the upper fuselage whereas most F.B.A. 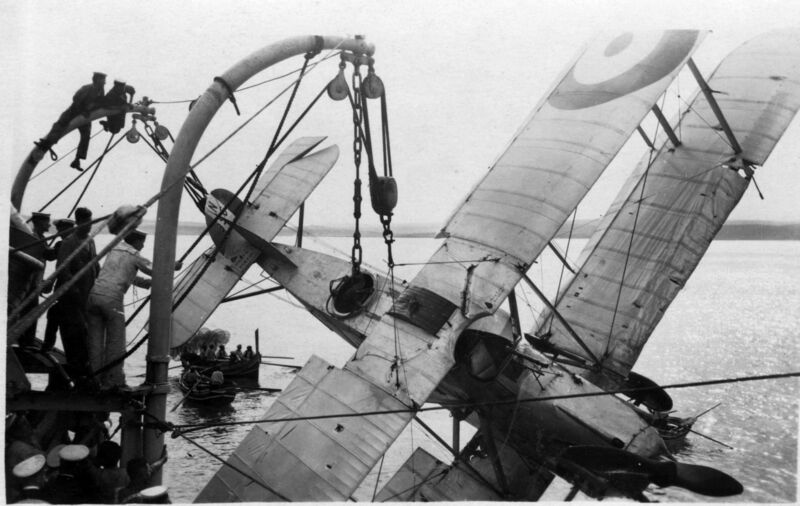 seaplanes had the lower wing on small struts fixed to the fuselage. There are what look like two bomb attachment points at the base of the port lower wing. 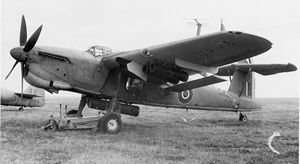 Top This Fairey Barracude RK328 is loaded up with mines and we can see one mk VII mine under the fuselage and two mk VIII small magnetic mines attached under the port wing. Note the aerial above the port wing. RK328 was a mark II Barracuda based at the Aeroplane and Armament Experimental Establishment in June 1945. Bottom The same Barracuda with a close-up view of the mk VII mine which had a 252 or 277 kg charge. The device on the front of the mine may be the magnetic firing pistol. Top 110047 Verso "Barracuda II with one Mk VII and two Mk VIII mines. 23 JUL 1945". Bottom 110048 Verso "Barracuda II fitted with 1 x Mk VII mine. 23 JUL 1945"
The Curtiss company was a prolific constructor of floatplanes and flying boats for the U.S. Navy just prior to and during the First World War. 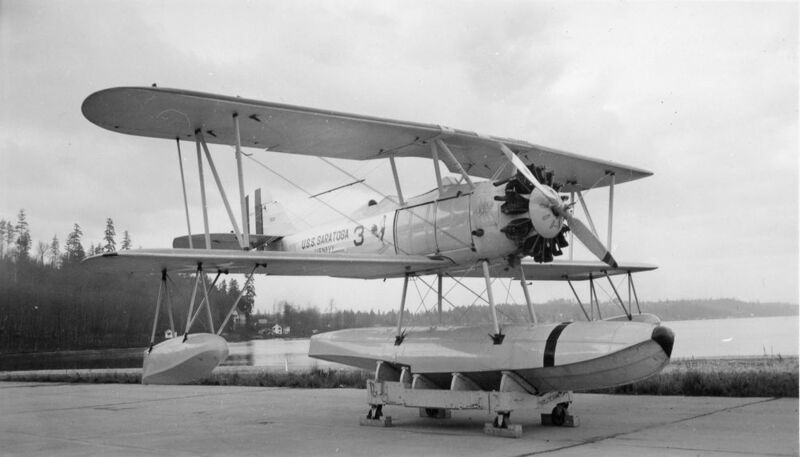 However, the Curtiss H-12 shown here without any naval markings was sold to the Royal Naval Air Service as were several others. They were named Large Americas. To prevent the nose from being pushed down into the sea during take-off, flotation was increased by incorporating sponsons into the lower hull. Recto: "92Ft. 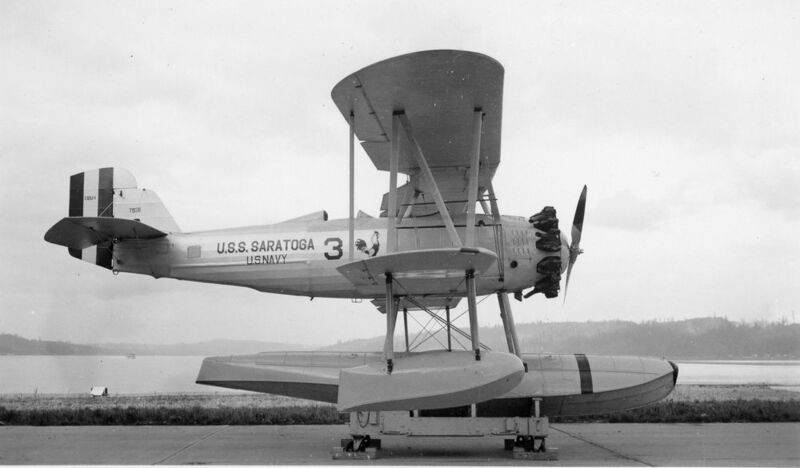 Curtiss Flying boat Model H-12-U.S.N. 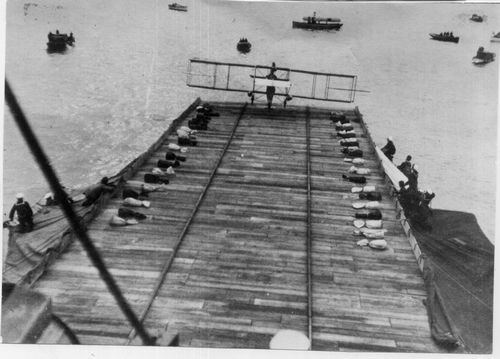 #59-R 4-7-17"
Top The ship's cutter is approaching the Friedrichshafen FF.49 floatplane with the gaff ready in the bows whilst the observer is preparing to pass over the mail. Bottom With the observer on the wing tip, the mail has gone over to the cutter which is pulling away whilst the aircraft engine idles over. Top 110047 Verso "Kutter holt Post" the cutter gets the mail. 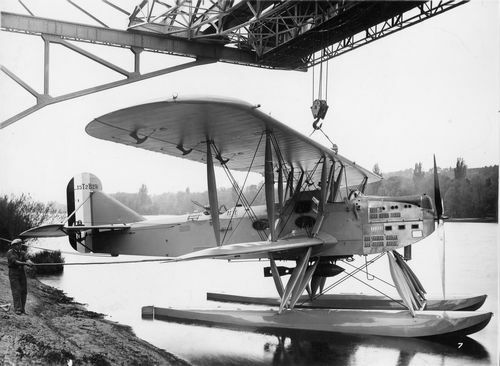 The Farman F150 was the 1926 successor to the Farman Goliath F60/F65 and is shown here as a floatplane for the French Aéronavale. The floatplane was powered by two nine-cylinder radial Bristol Jupiter engines built under licence by Gnome and Rhone but as there was no increase in performance on the Goliath, only one marine version was made. Note the magnificent wooden propellers and the forward gunner's position. 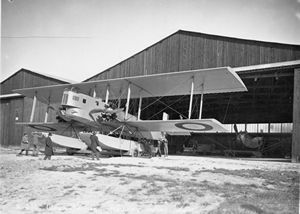 At the rear of the hangar is a monoplane aircraft with what looks like a peculiar large single float. Bottom Serial number 7936 was attributed to the aircraft carrier U.S.S. Saratago. The sturdy lines of this centre float biplane can be clearly seen. 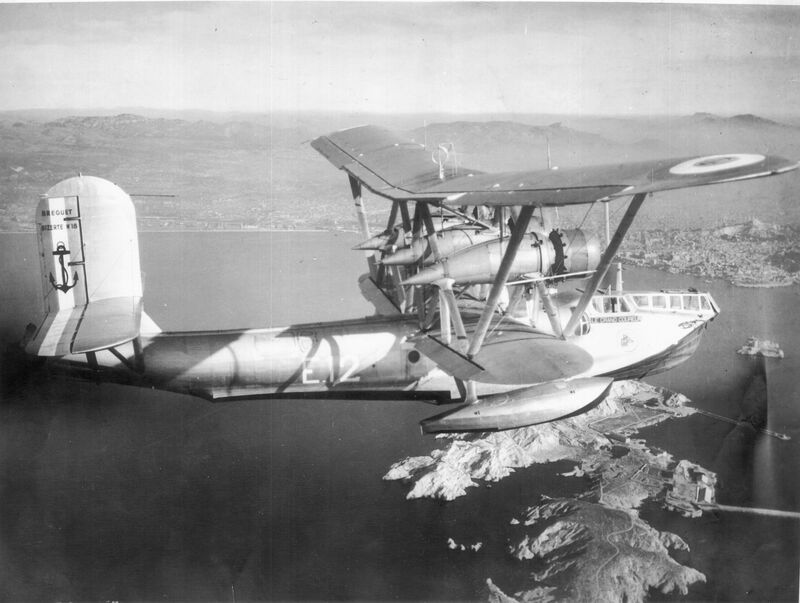 The US Navy Bristol XLRQ-1 was a prototype flying boat glider of which two were built in 1943 then the project was abandoned as being not tactically feasible for beach assault. 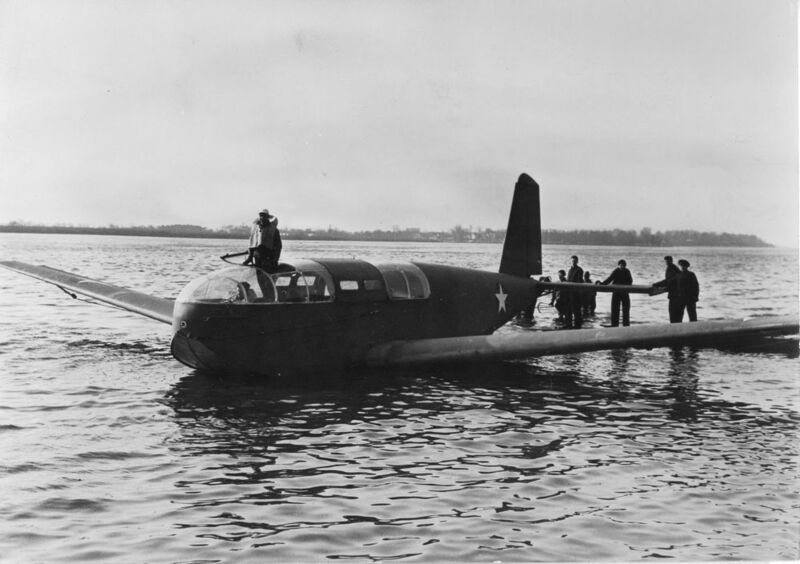 Verso: "U.S. Navy seaplane glider. Known as the XLRQ-1, the U.S. Navy's new seaplane glider is shown after it passed its initial tests at a naval base on the U.S. East Coast. 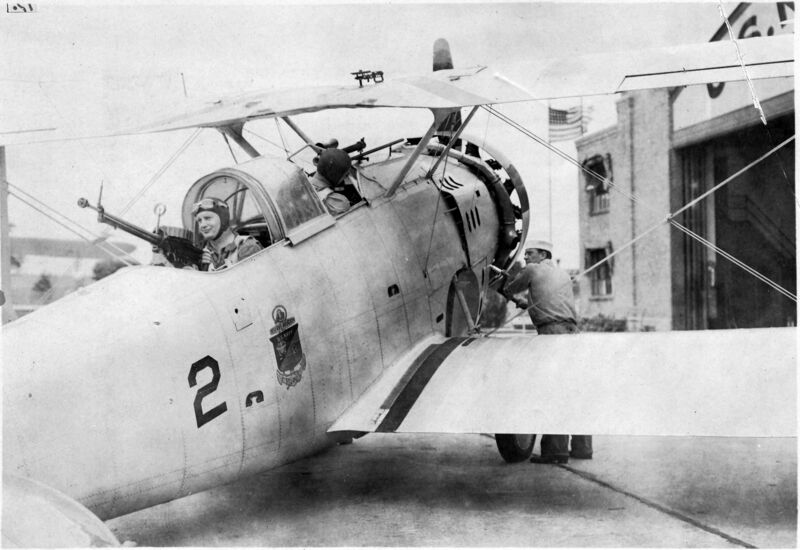 Commander Ralph S. Barnaby, the Navy's first glider pilot, is standing in the cockpit. The seaplane glider is designed to carry either troops or cargo. Later models will be amphibious. 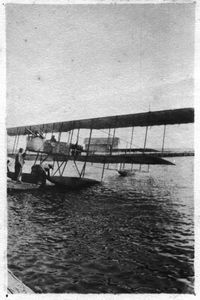 Important Not for use in the Western Hemisphere"
The IJN bought several Farman seaplanes from 1912 onwards. Japan was a valuable ally during the 1st WW, sending ships to the Mediterranean. 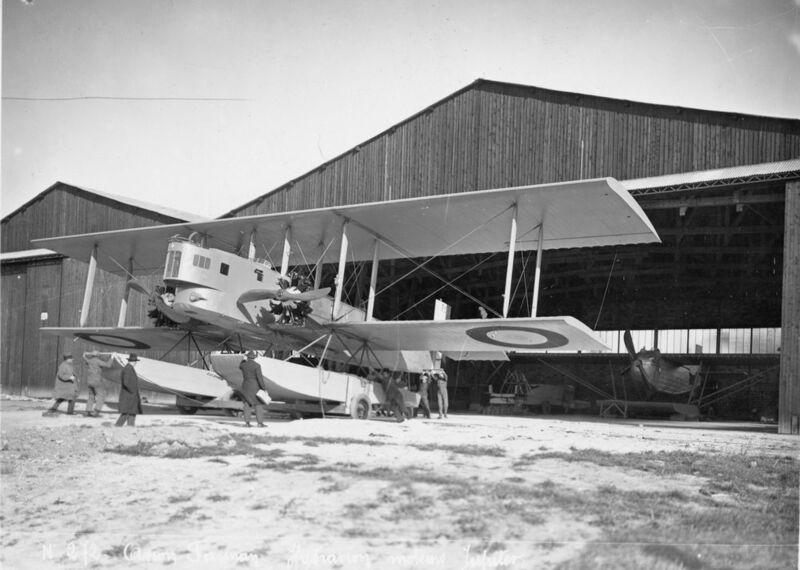 The Sopwith S PG N seaplane was a pusher type gunbus ordered by the Royal Navy in 1914 but initially built after an order from the Greek Naval Air Service. 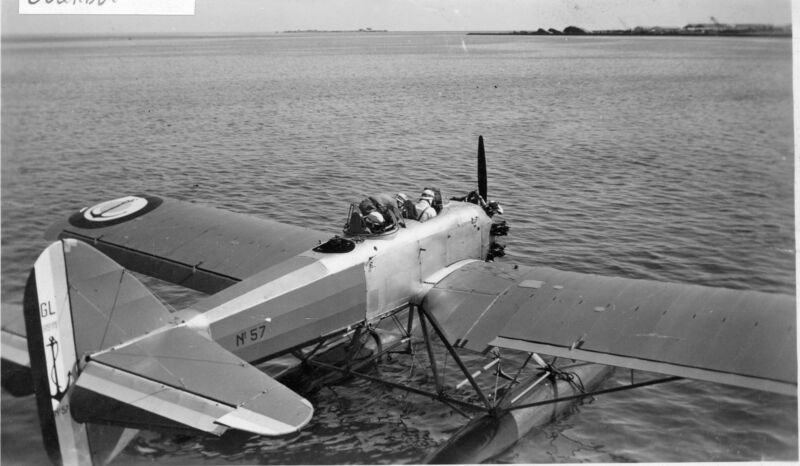 It had a large wingspan of 80-ft and we can see both gunner and pilot on board with a Lewis gun mounted in the nose (which eliminates this seaplane as being one of the Greek unarmed trainer versions). The engine appears to be the Gnome Monosoupape or the Sunbeam V-8 engine and with the latter engine, the Gunbus was designated Admiralty Type 806. We can see three different German seaplanes in this photograph. The center biplane is peculiar in that the fuselage is placed above the wings, with the two engines near to the centre line on the lower wing. 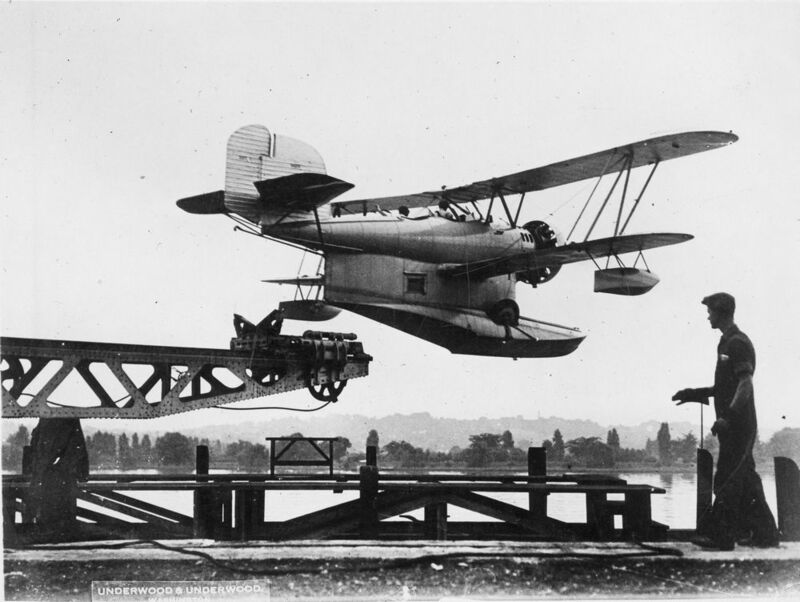 The seaplane has a double tail with the gunner's position forward and the pilot seated just behind the upper wing. 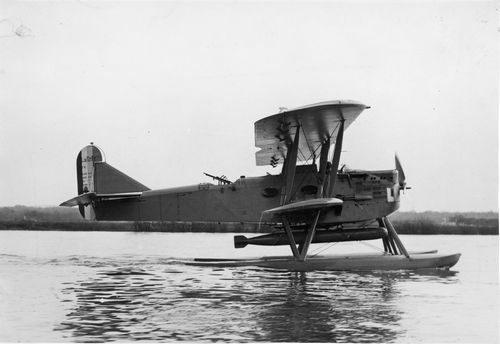 It is the only example built of the Ursinus-Wasser-Doppeldecker (UWD or WD4), a floatplane version of the Gotha G.I. 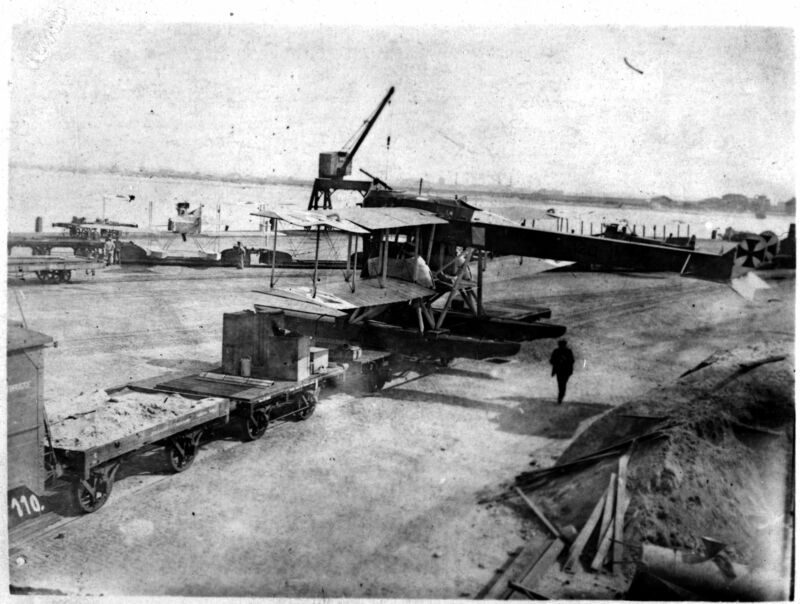 delivered to the Seaplane Testing Command in December 1915. 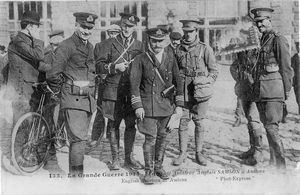 This photograph may be of the Gotha UWD on the mole at Zeebrugge, on the night of 19th to 20th May 1916 the Gotha UWD took off from Zeebrugge to take part in a raid on Dover. The floatplane to the left of center may be a Friedrichshafen FF33, three or four of which accompanied the Gotha UWD on the raid. A Caudron G4 seaplane at the Navy base in Saint Raphaël. 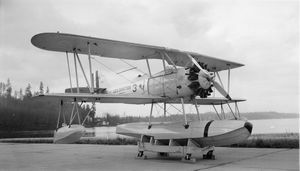 This version has floats but the French Aéronautique Maritime as well as the Royal Naval Air Service (R.N.A.S.) 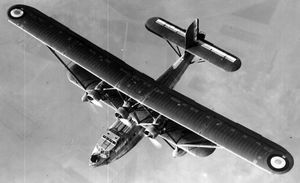 extensively used this rather clumbersome bomber in its wheeled-undercarriage version. The seaplane is being towed out to sea by a motor launch. This stero-photograph is one of a series of ten taken at the naval base of Saint Raphaël around the time of the First World War. The Caudron G4 was armed with a machine gun mounted in the front cockpit and could be loaded with bombs fixed beneath the lower wing. We can see both in this stereo-photograph. 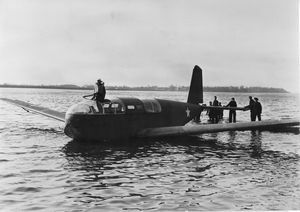 With its pod cockpit, twin engines and wooden boom structure with a four tail arrangement, the G4 appears to be rather frail but was appreciated by the R.N.A.S. 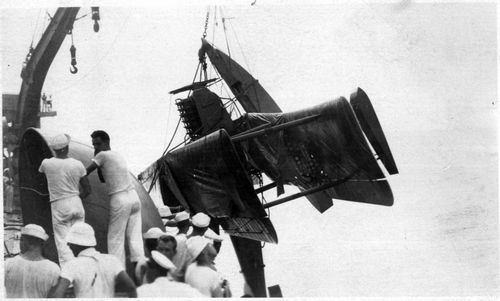 During the inter-war period, most navies experimented with and perfected the catapult launching of aircraft from ships. The role of ship-launched aircraft for observation, spotting for the guns and scouting was fully recognised. 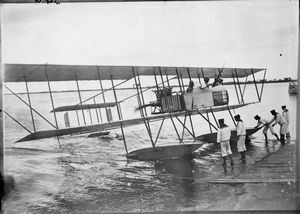 The Loening Company developed, in particular, amphibious seaplanes and the similarity between these amphibians and those of the Grumman company are not fortuitous. Leroy Grumman was General Manager at Loening and when he left the company to start his own, he incorporated many concepts developed at Loening. This photograph shows the sole prototype XO2L-1 sometime around 1932, performance was such that the Navy did not pursue trials, note the arrester hook. Ironically,the Navy went to Grummans looking for a new amphibian and the result was the JF/J2F Duck. Verso: "Verso: "Navy tests catapults at Washington Navy Yard. Washington D.C. A combination of the oldest and the newest weapons of warfare, the catapult, which hurled missiles into beleaguered cities in the Middle Ages and the airplane of today, has been developed by the U.S. Navy to release planes from small decks of ships and its undergoing tests at the Navy Yard here. This picture shows a thrilling closeup of an amphibian plane as it is hurled into the air after a run of only 60 feet, by the catapult. The carriage and arresting gear of the catapult are also shown in the photo". After the First World War, the US Navy became interested in the VE-7, a wheeled-undercarriage advanced trainer, and 128 of the naval version were built to perform numerous roles other than a standard trainer. 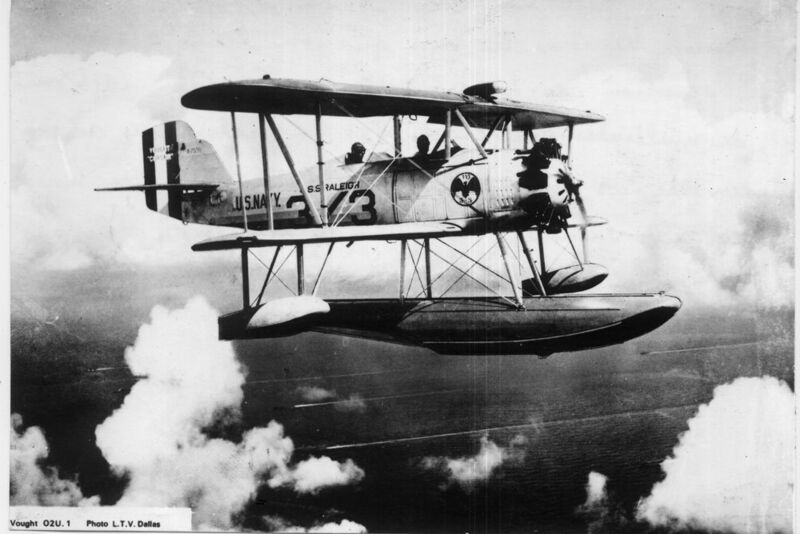 The VE-9H floatplane was an improved version of the VE-7SH floatplane and the US Navy ordered 21 to be used for observation and scouting when catapulted from battleships and cruisers. Verso: "Launching device for planes perfected. Further tests of the catapult on the (USS Battleship, author's note) Maryland were conducted at Hampton Roads, Va., in the presence of Admiral Jones, Comm. in Chief, U.S. Atlantic Fleet and Admiral Moffet, Chief of the Bureau of Aeronautics, who says, "The catapult is no longer in the experimental stage. It is as practical and workable as is the torpedo tube used for launching torpedoes from the deck of a destroyer. Furthermore….and commercial activities." Blue stamp marked 23 August 1922, in Spanish. Source: "Photo by Paul Thompson"
This Vought Corsair is equiped with a Pratt and Whitney Wasp engine but it is not yet the amphibious version of the O2U-1. This aircraft, serial number A-7535, was part of the VO-3S squadron with the battleship divisions. It was, at the time, the standard aircraft for observation divisions. 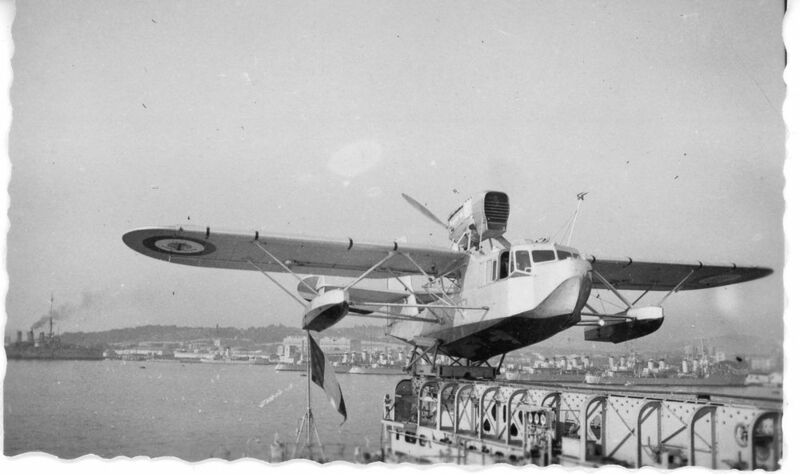 The Loire 130 first flew in 1934. It was said to be ugly - a compliment it shared with the Supermarine Walrus - but it had a sturdy appearance and was used in many roles, being carried by all major French warships. Endurance was 7 ½ hours at 93 mph with the pilot in an open cockpit above and to the rear of the main cabin - we can just see the top of his windscreen. The Loire 130 carried two 7.5mm Darne machine guns in bow and dorsal positions and could carry two 165-lb bombs, it was launched from a compressed air type of catapult fixed to the top of the aft gun turrent. 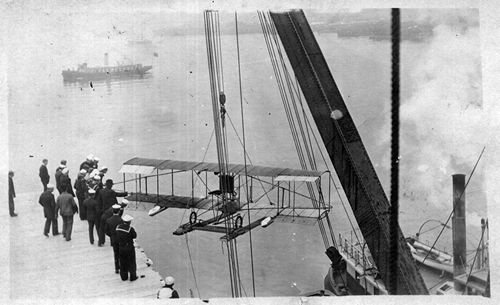 In 1910, Eugene Ely flew a Curtiss biplane off the deck of USS Birmingham for the first shipboard aircraft takeoff. The experiment took place whilst the ship was at anchor in Hampton Roads, Virginia. Here we can see Naval personnel and dockyard workers placing the tailless aircraft onto the sloping 85 ft long and 24 ft wide wooden platform on the bows of the ship. Two months after the first deck takeoff, in January 1911 Eugene Ely landed his Curtiss biplane on the deck of USS Pennsylvania, at anchor in San Francisco bay. 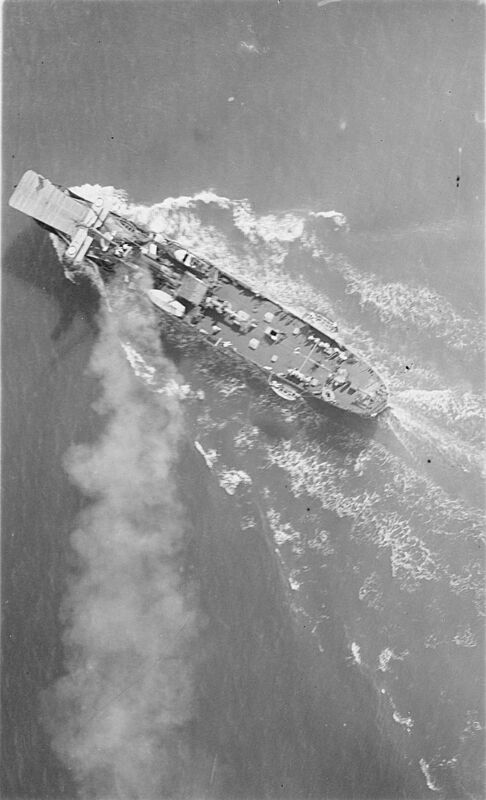 The aircraft was equiped with a tailhook designed to catch one or more of the ropes fixed across the deck and attached to sandbags - an early form of arrestor wires - so as to bring the aircraft to a halt. After such a pionneering début, Ely was sadly killed in an aircrash the same year. 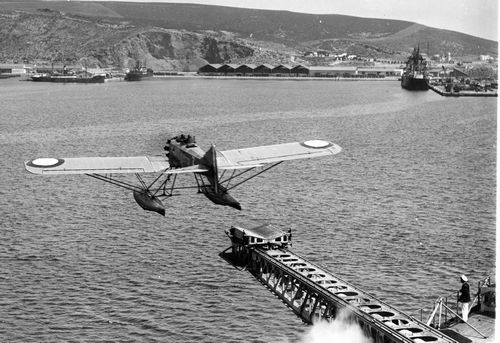 As the performance of aircraft improved and floatplanes became available, experiments in launching aircraft from ships continued. 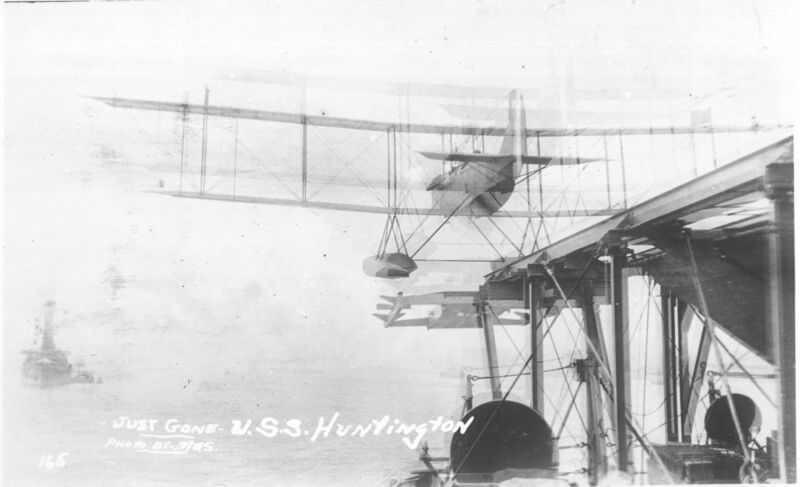 Here on USS Huntington, a floatplane is about to take off from a narrow rail-like ramp built up over the quarter deck and stern. The trolley on which the aircraft rested can be see about to be jettisoned into the sea after running off the launching ramp. 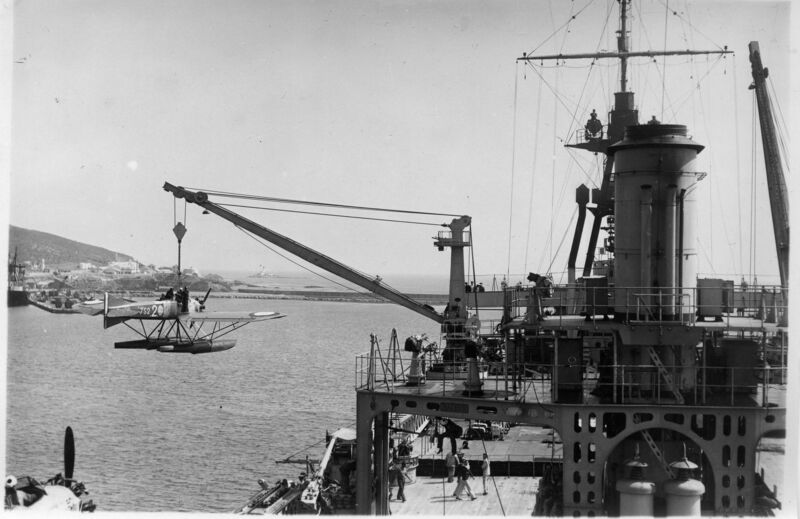 Accidents were frequent in the early days of naval aviation and this floatplane from USS Huntington has come to grief and is being hauled on board. We can see that one float is missing and the wooden propellor is smashed. The Bapaume was a sloop transformed into an early form of aircraft carrier by building a 35 m long flight deck forward of the bridge. This aerial view shows an aircraft on the flight deck and Bapaume is steaming across the wind - see the direction of the smoke from the funnel. Verso "Bapaume - Un avion abord"
If land-based aircraft were being used for take off and landing trials on ships, seaplanes with floats were also being developed but they needed a relatively calm sea to take off and land. 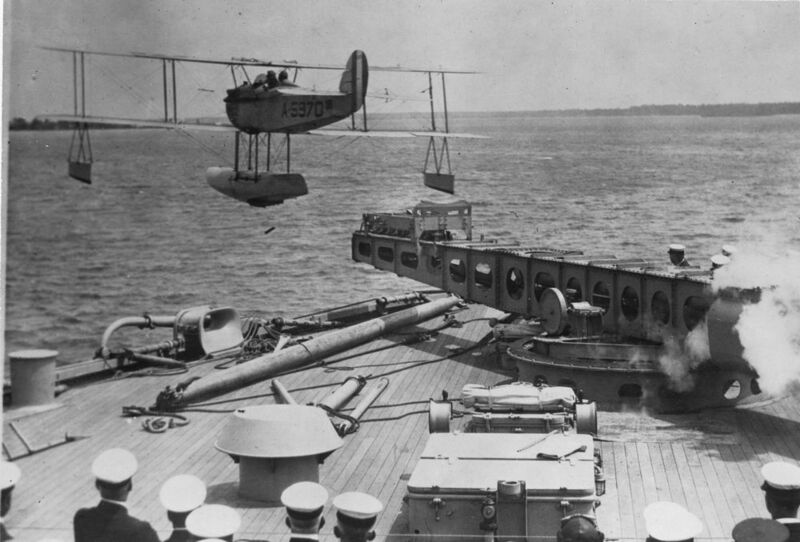 Dédalo is seen with a group of seaplanes on the aft deck and there are two hoisting booms port and starboard to lift aircraft in and out of the sea. This ship also had a hanger forward to house observation balloons or airships and in this photograph, taken off Al Hoceima, we can see the airship mooring mast at the bows with a windsock. Recto "Navire porte avions Espagnol"
The Hawker Osprey followed on from the Fairey IIIF seaplane in the early 1930's with a new level of performance producing a fast, two-seater fighter-reconnaissance aircraft, maximum speed 176mph as opposed to 120mph. 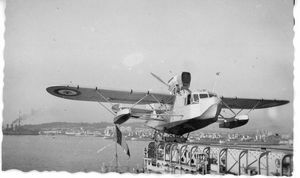 This aircraft, K3629, had a short life and after delivery to Gosport in 1934 it went first to HMS Sussex and then to the Middle East at the end of 1935, to be struck off in April 1936. Verso "H.M.S. Sussex Croiseur anglais" in black ink then printed "Issued 20-12-35 Eyes of the fleet. 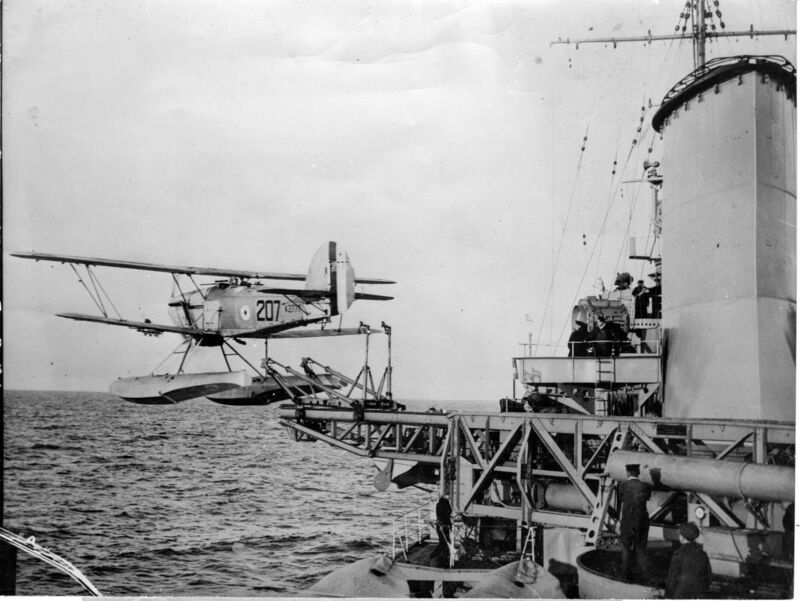 A scouting seaplane warming up on the catapult of the cruisser H.M.S. SUSSEX. 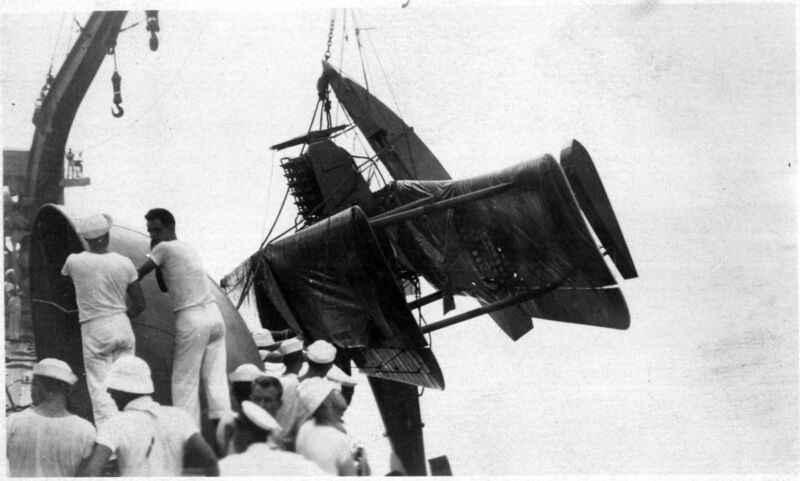 This photograph illustrates the intricate mass of machinery needed to give the plane a good "push off" on launching." 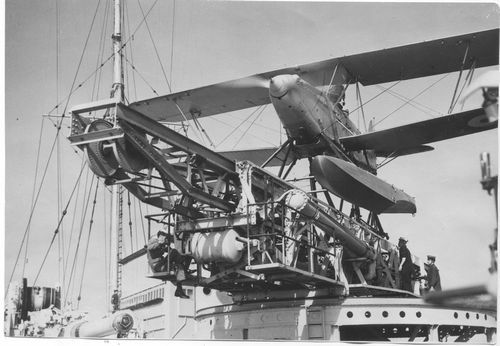 Working aircraft from warships presented numerous problems including the large amount of space taken up by the aircraft and its catapult, the fire risk due to fuel storage, the need for suitable conditions to catapult and especially to recover the seaplane as well as the risk of blast damage from the ship's guns. Compressed air acting on fluid-filled rams propelled the 2,526 kg Osprey along the catapult. The aircraft is supported on a cradle and in this photograph, the aircraft has just left its cradle, the front legs of which have fallen forward to allow the fuselage and tailplane to pass over. This aircraft, K2777, spent much of its time attached to the RAF School of Naval Cooperation where pilots and observers were trained for the Royal Navy. This Avro Bison mkII, N9969, was with HMS Eagle in 1926 and came to grief during exercises when, en route from Gibraltar to Malta, it developed engine trouble and came down into the sea off Valletta. All six aboard were killed although the usual crew was three or four. The Bison was an ungainly beast developed as a fleet spotter with a large cabin for observers and wireless operators and all their paraphernalia - maps, plotting tables, wireless sets in an exceptionally large cabin with big windows. The body of the Bison was set so high for the pilot, it was necessary to provide an aiming rod parallel to the line of flight to assist the pilot in landing and taking off. This rod can be seen to port of the centreline at the level of the windscreen. The Bison was armed with a free-mounted Lewis machine gun on a Scarf ring amidships - here by one of the lifting points - and a single fixed Vickers machine gun firing through the propeller - seen here as a raised cover on the engine cowling just starboard of the centreline. Top PL15: Although the sleek lines of this torpedo-bomber floatplane contrast with the Avro Bison, its performance - maximum speed 118 mph, cruising speed with full load 99 mph - was weak. This aircraft carried a crew of two when in the torpedo-bomber role, three and four when on observation and reconnaissance missions, respectively. 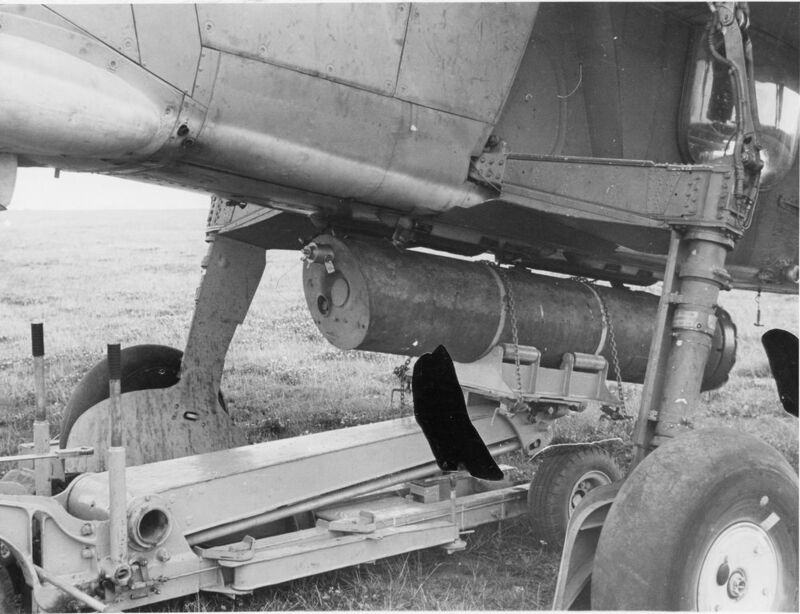 We can see the twin 7.7mm Lewis guns in the rear mounting and a bomb fixed under the fuselage. Note the rearview mirror fixed to the pilot's windscreen. The four handles just forward of the gunner's post may be for releasing the bombs and the torpedo - the PL15 could carry either one 750kg torpedo or three bombs (1 x 450 kg and 2 x 150kg). It was too heavy to be catapulted and had to be lowered into the sea for take off. Bottom PL14: The PL15 was derived from the PL14and in this photograph, the aircraft is armed with a 45cm torpedo but it could carry 450kg of bombs and was armed with a single 7.7 Vickers machine gun. Bottom 94125 Verso "Pierre Levasseur Constn. Aeronautiques" "Hydravion bombardier torpilleur 600 CV" in blue crayon and "P.L.14" in blue ink"
This biplane had several modern develpments compared to the older Naval aircraft which included an all-metal fuselage and a much appreciated enclosed cockpit as well as a retractable undercarriage. The Grumman FF did not stay long in first-line service and was withdrawwn to the Naval reserve aviation at the end of 1936. This aircraft is with the Reserve Aviation at Saint Louis, Missouri, Naval Air Station and shows the rear gunner with a single 7.62mm Browning machine gun. The pilot is watching the ground crew as he cranks up the Wright Cyclone radial engine. 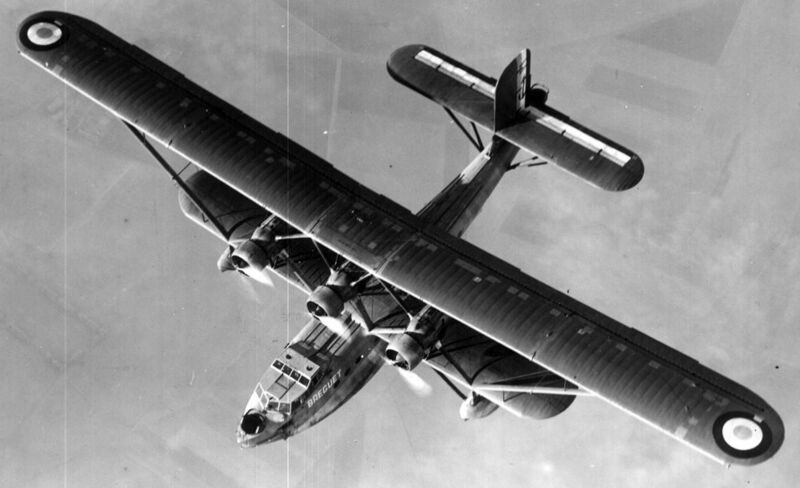 Top The Gourdou-Leseurre GL812 also had a light alloy fuselage on a steel tube structure. We can see the pilot and the gunner at their posts, the observer is doing something on the wing. Initially, the observer had the centre post but was moved back in the L-3 model. Note the flying helments and the headrests for pilot and gunner, very useful during catapult launches. This aircraft doesn't seem as yet to have been allotted to a squadron as the only identification is the number 57. 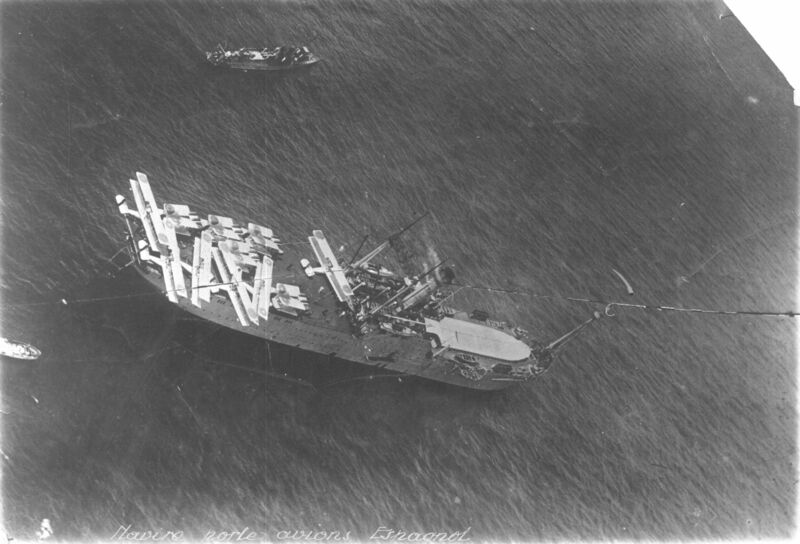 Middle The GL812 could be catapulted off a ship, here the seaplane carrier Commandant Teste. Note the aircraft rests on the trolly by the float supports as opposed to the fuselage as for the Hawker Osprey shown above and as a result, a strengthened float structure was required. The ramp used to propel the trolly forward can be seen through the lattice structure of the catapult. Bottom This aircraft is from the 7S2 squadron and is being recovered onto the Commandant Teste in the port of Arzew in 1937. Just left of centre in the foreground is one of the unshielded 3.9 inch guns and on the raised deck are two quick-firing guns, whilst a sailor seems to be painting the underside of this structure. Top The Breguet 521 Bizerte was a French development of the British Short Calcutta flying boat built under licence by Breguet. This long-range reconnaissance aircraft had a two-tier flight deck and an open bow gun position initially. Note the impressive span of the upper wing - over 35m. Bottom This photograph shows one (N°18) of the batch that were ordered in 1936 with the elimination of the open bow gun position and the extended cockpit canopy which was well-adapted for the role of long-range reconnaissance. 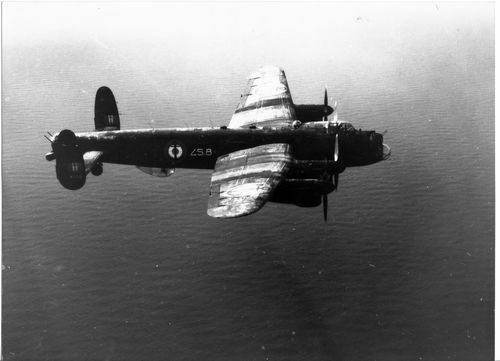 Note the important dihedral angle of the upper wing, the radio direction finding aerial on the top of the wing, the wolf emblem of the E1 squadron on the hull and the gun blister just aft of the cockpit. This aircraft is flying over the Iles du Frioul off the coast of Marseille in 1937. 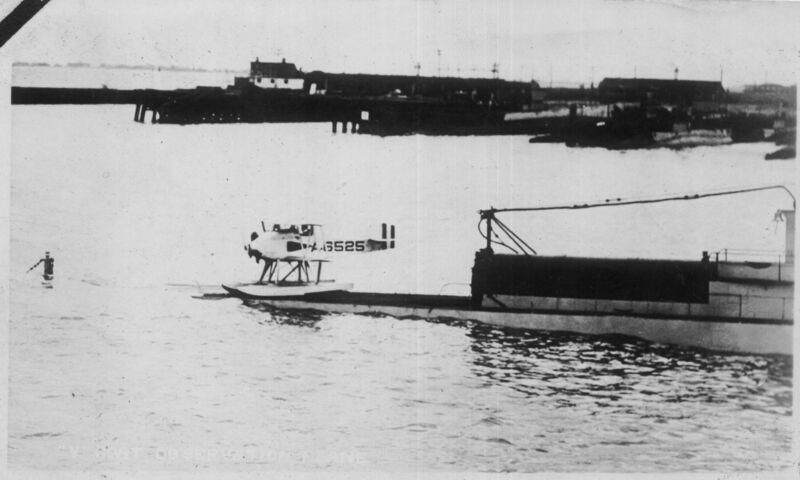 Between 1923 and 1926, the US Navy experimented with the use of a small observation and scouting seaplane carried and launched from a submarine. The Marin MS-1 biplane was carried in a water-tight container on the submarine's deck and once on the surface, the aircraft was to be quickly assembled and launched by balasting down the submarine until the seaplane could float off. This is the manoeuvre that we can see in the photograph of A-6325 floating off the submarine S1. One. The Saunders-Roe SR.A/1 was a revolutionary, water-based aircraft with a top speed in excess of 500 mph. Construction began in 1946 to produce this single-seater, twin jet-propelled flying boat fighter. It had no official name and was referred to as the "Squirt" but the project came to an end in the early 1950s as the Squirt lost out in the competition with the new land-based jet fighters that were appearing on the scene plus the success in war of the aircraft carrier. Shown here is one of the three prototypes (TG263) with the initial Perspex bubble canopy. 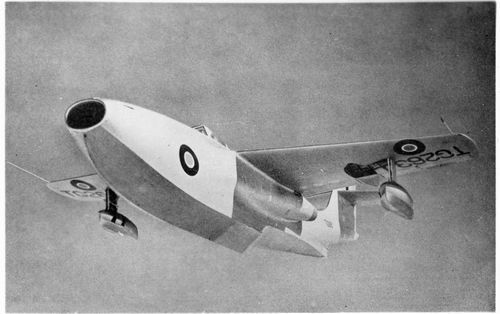 It had two Metropolitan-Vickers F.2/4 Beryl axial flow turbojets placed side by side in the fuselage and sharing the same nose air intake but with separate exhausts. Surprisingly, it is said that there was no problem with water ingestion but the SR.A/1 was not designed to operations in choppy seas. Two. The first test flight took place on 16th July 1947 and the test pilot Geoffrey Tyson reported satisfactory handling of the flying boat both in the air and on water. Here, the flying boat is just sitting on the step of the planing hull. Three. The SR.A/1 had semi-retractable floats to improve the aerodynamics. Each float first pivoted inwards through 90° before the arm folded into a well in the lower surface of the wing. This way, only the streamlined part of each float was exposed. In the first photograph, we can see the two dark bands of the pivoting mechanism on each float. In the lower photograph, we can see the orifice for the planed four nose-mounted Hispano 20mm cannons. Four. 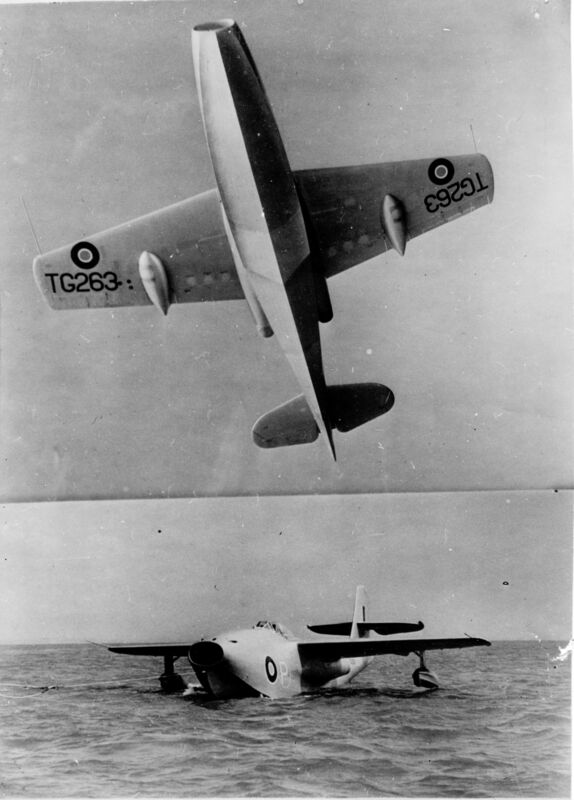 TG263 was brought out of store in November 1950 and hydrodynamic tests recommenced, the last flight being in June 1951. Here we can see the underwing recess on the port wing and the float pivot points as two dark areas on the starboard float. Five. 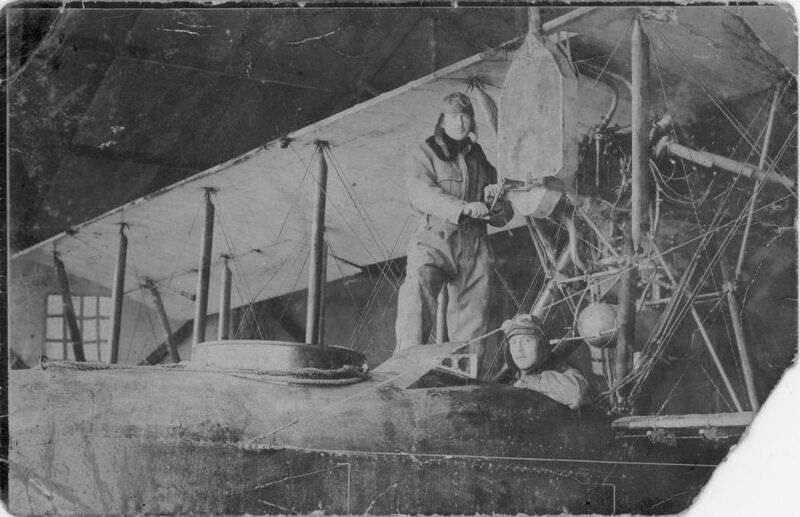 After the initial trials, several modifications were made including replacement of the Perspex bubble canopy with a metal canopy and reducing the rudder horn balance as can be seen in this photograph. A short take-off could be attained - 26 seconds - by retracting the wing floats, and so reducing drag, once the aircraft had lateral stability. Two. 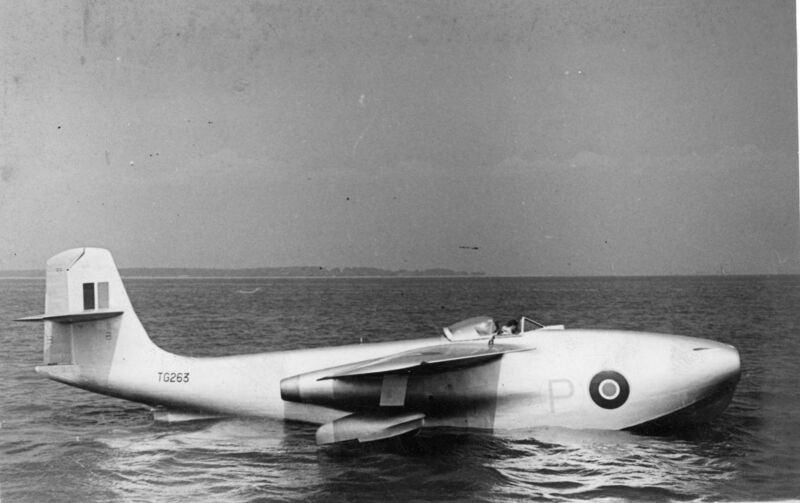 Verso: "Britain has first jet flying boat fighter. 30.7.47. 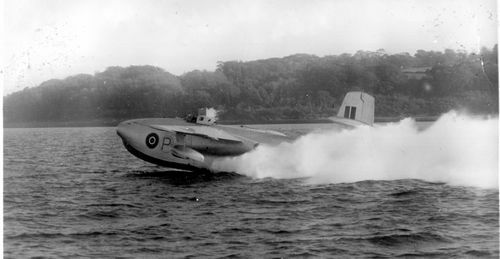 The first jet-propelled flying boat fighter in the world - the Saunders-Roe A1 - was successfully tested at Cowes, Isle of Wight, this afternoon. It is fitted with twin Metropolitan Vickers jet units known as the Beryl, but its maximum speed is a top secret. The picture shows the jet-propelled flying boat taking off on her trial flight to-day." Three. Verso: "First flying boat tested. 31.7.47. The world's first jet-propelled flying boat fighter, the Saunders-Roe SR/A1 made its first …. appearance over the Solent yesterday, after …. "hush-hush" test flights. It has ….a speed of more than 400m.p.h….in a pressurised cabin, and it….cannon. The pilot has an ejector seat." Minds were not totally at rest with the end of World War II and European governments, notably France, feared a revival of German aggression such that in 1947, the United Kingdom and France signed a treaty of alliance and of mutual assistance in the event of renewed attacks. As the communist threat developed, the Benelux countries joined the United Kingdom and France to form the Western Union. 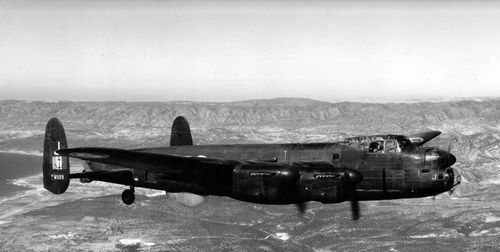 As part of the agreement, 54 reconditioned Avro Lancaster bombers, with the serial prefix WU, were transferred to the French Aéronavale. Along with the RAF Coastal Command, they were to protect Atlantic shipping. The French aircraft were based in North Africa and this aircraft, WU09, joined the 2F squadron at Port-Lyautey on the Atlantic coast of Morocco in 1952. The WU aircraft were modified for their new role of maritime reconnaissance with the addition of long-range fuel tanks, ASV (aviation surface vessel) radar (model APS-15) in a ventral dome and extra rear windows for observation whilst the dorsal turret was faired-over. The aircraft also carried Air-Sea Rescue equipment. We can see members of the crew looking out of the astrodome and the portside rear windows. A rather weather-worn Lancaster. We can see three dorsal aerials for the radar and a crew member is in the astrodome. Note the different size of the machine guns, this Lancaster has retained the forward twin 0.303-inch Brownings and the tail twin 0.5-inch machine gun turrets. As for the photograph number 40130, there appears to be some kind of shoot projecting from the rear turret, is it for releasing air-sea rescue gear?